Chica Bonita ,Reg Half -Welsh 2009 Filly by NF Brenin Cardi - Cottage Farm Inc.
What can I say about this lovely mare. She is by the wonderful Welsh "D" stallion NF Brenin Cardi aka Cardi who is now a confirmed at Grand Prix and is blowing away his horse size competition! Chica , a homebred out of my favorite mare Mishcka aka Jasmine, is a delight to be around. She takes everything in stride, is easy to train and wants to please. This filly is one of my all time favorites and could be easily be a child's or smaller AA mount. She has never given any difficulty since being started and like all our homebred horses she was trailered off property from a young age . She went to polo regularly where she stood tied to the trailer, got ridden next to the field during chukka's . 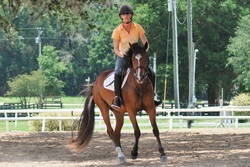 She has been lightly shown and has scores in the 70's at Intro. She has also been jumped lightly. No health problems and a super easy keeper. The video below is Chica as a three year old being schooled at the HITS showground.